As recently as 1960 few women worked outside the home, married women could not borrow money in their own names, schools imposed strict quotas on female applicants, and sexual harassment did not exist as a legal concept. 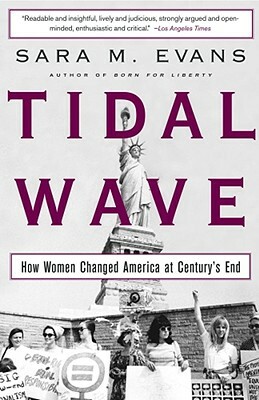 In Tidal Wave, Sara M. Evans, one of our foremost historians of women in America, draws on an extraordinary range of interviews, archives, and published sources to tell for the first time the incredible story of the past forty years in women's history. Encompassing the so-called Second Wave of feminism (1960s and 1970s) and the Third Wave (1980s and 1990s), Evans challenges traditional interpretations of women's history at every turn. Covering politics, economics, popular culture, marriage, and family, and including the perspectives of women ranging from leaders of NOW to little-known women who simply wanted more out of their lives, Tidal Wave paints a vast canvas of a society in upheaval. The movement's shocking success is evinced, Evans notes, by the simple fact that we now live in a country in which all women are feminists, in practice if not in name. Sara M. Evans is Distinguished McKnight University Professor of History at the University of Minnesota, where she has taught women's history since 1976. The author of Born for Liberty and Personal Politics and the coauthor of Free Spaces and Wage Justice, she lives in St. Paul, Minnesota. Readable and insightful, lively and judicious, strongly argued and open-minded, enthusiastic and critical. Meticulously researched and with an unequivocal respect for detail and balance, Evans offers a comprehensive and compelling historical overview of the status and role of women in contemporary society. A well-written, critical overview of feminism's real contribution, useful and timely. [Evans'] depictions...vivify, as no generalizations could, the extraordinary creative reach of the movement.